Philippe Geluck is a Belgian humourist, writer, illustrator, actor, comic, star of stage and screen (the small one), and the French-speaking world’s most popular and successful cartoonist. He is someone to whom the not-always-flattering epithet Big in Belgium can be genuinely applied - a phrase actually coined by Queen Victoria about Philippe Geluck during one of her trips to visit her Uncle Leopold. 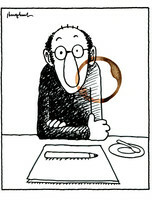 Most famously Geluck is the creator of Le Cat (or Le Chat as it is written on his birth certificate). Eight million copies of his 17 albums (yes 8 mill!) have been sold since Le Cat was born 30 years ago, mostly in (the few remaining ...) Francophone countries. Geluck and Le Cat have now decided that it’s time, in the spirit of unbridled globalization and planetary sharing, to send the feline forth into Angloland - i.e. the-rest-of-the-world - so that all God’s people can benefit from his wit and wisdom (and multiply the sales figures). To do that Le Cat had to learn English, which, being a fat but smart fellow, he has done in record time. A devout Francophone, he had so far only dabbled his linguistic paw in the Netherlands. And this is why, for the first time, you’re reading about Geluck and Le Cat in English on this site.